The evolution of an urban scientific community under the pressures of conceptual and social change is the main focus of this book. Manchester was Victorian Britain's leading industrial city. 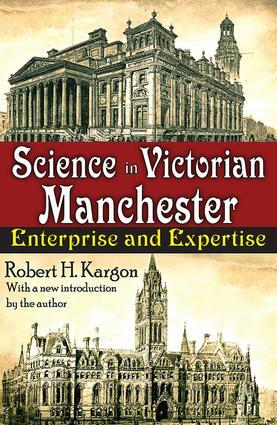 In order to describe and analyze the transformation of science in the eighteenth century, Robert Kargon closely examines Manchester through successive stages. In so doing, he traces the evolution of science from an activity pursued by gentlemen-amateurs to a highly specialized profession.At the end of this process, the author shows, a major trans formation in our understanding of the nature of science can be discerned: scientific knowledge, it was realized, could be produced. Science was no longer regarded primarily as the di vine design rendered into laws of nature, but rather as a method, or instrument, to be applied to novel areas of human endeavor. Science had become on the one hand enterprise, and on the other expertise. In each chapter, Kargon relates the changing conception of science and its social role to the birth, growth, and character of the city's scientific institutions.The contours of the scientific community-its interests, concerns, and approaches to what it came to see as critical problem---were shaped by its civic environment. Its character, in turn, responded to the development of the disciplines represented within it. As the sciences increased in specialization and complexity during the course of the nineteenth century, they placed new stress upon the community, affecting the composition of its membership and the nature of its leading institutions. The scientific frontier reacted upon Manchester just as Manchester acted upon it. Now available in paperback, this classic work in history includes a new introduction by the author.